The exhibition is dedicated to the most recent phase in the history of artists’ books. 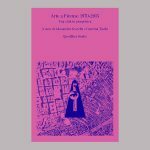 These are works of art that borrow the format and the particular modes of distribution and consumption of the book; they are not books replicating works of art, but works of art that exist exclusively through the format of the book. All the books selected are either self-published or participate in a minor economy of small independent publishers. Their modes of production and circulation, as well as the conditions under which they are housed and experienced, create and reinforce their content. Following those Following those at Corvi-Mora Gallery in London and at Artists Space in New York, this is the third exhibition curated by Gregorio Magnani’s ongoing archive of recent artist’s books. In Florence the books selection underscores the various ways in which books occupy, condense, infiltrate, activate, explode, or are inhabited by space. Books-as-sculptures, books that occupy other books’ space, or are invaded by the space surrounding them, guide us in this exploration of the most recent development of the book as a medium of artistic expression. Books by: Anonimo, Kasper Andreasen, Diana Artus, blisterZine, Daniel Gustav Cramer, Mariana Castillo Deball, Michael Dean, Arnaud Desjardin, Johanna Drucker, Melissa Dubbin & Aaron S. Davidson, Karl Holmqvist, Takashi Homma, Brian Kennon, Louis Lüthi, Sara MacKillop, Kristen Mueller, Sophie Nys, Asher Penn, Chiara Pergola, Simon Popper, Lucy Powell, Alessandro Roma, Karin Ruggaber, Christoph Schifferli, Izet Sheshivari, Rachel Simkover, Erik Steinbrecher, Mladen Stropnik, Derek Sullivan, Nik Thoenen & Lorenzo le kou Meyr, Peter Tillessen, Erik van der Weijde, Jean-Michel Wicker.